VATICAN CITY – The Holy Spirit continues to give Christians different gifts and to call them to share those gifts with each other in a community marked by forgiveness and “unity in diversity,” Pope Francis said on Pentecost. With tens of thousands of Catholic charismatics from around the world and with dozens of Pentecostal and evangelical leaders present, Pope Francis celebrated Pentecost Mass June 4 in St. Peter’s Square and concluded a five-day celebration of the 50th anniversary of the Catholic charismatic renewal. In his homily at the Mass, the pope said Christians can block the unity in diversity desired by the Holy Spirit by focusing on their differences rather than on what they share. “This happens when we want to separate, when we take sides and form parties, when we adopt rigid and airtight positions, when we become locked into our own ideas and ways of doing things, perhaps even thinking that we are better than others,” he said. When the Holy Spirit descended on the disciples at Pentecost, he said, the first gift the Spirit brought was forgiveness for their sins and the grace to forgive others. “Here we see the beginning of the church, the glue that holds us together, the cement that binds the bricks of the house: forgiveness,” he said. Pope Francis began his Pentecost celebrations at an ecumenical vigil June 3 with some 50,000 Catholic charismatics and Pentecostals from more than 125 countries gathered for praise and worship at the site of the ancient Roman Circus Maximus. Although less exuberantly, the pope, too, sang with his hands cupped open or with his hands raised. He stood between Michelle Moran, president of the International Catholic Charismatic Renewal Services, and Patti Mansfield, who was present when the Catholic charismatic renewal was born. In February 1967 Mansfield was one of the Duquesne University students, who experienced an outpouring of the Holy Spirit during a retreat. 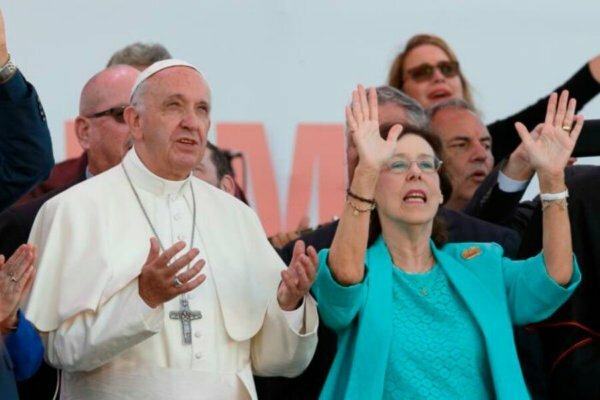 The charismatic renewal is “a current of grace,” Pope Francis told the crowd at the Circus Maximus. “It is a work that was born – Catholic? No. It was born ecumenical,” with similar results in many denominations and with Pentecostals providing support and education to new Catholic charismatics. In ancient Rome, Pope Francis said, Christians were martyred in the Circus Maximus “for the entertainment of those watching.” He urged the crowd to remember how many Christians are being killed for their faith today and to recognize that their murderers are not asking them their denomination, just whether or not they are Christian. “Walk together. Work together. Love each other,” Pope Francis told them. Being baptized in the Spirit and knowing how to praise God, he said, “are not enough” if Christians don’t also help those in need. An Italian Pentecostal pastor, Giovanni Traettino, a friend of Pope Francis’ since they met at an ecumenical charismatic gathering in Buenos Aires in 2006, told the crowd that as Christians grow in their love for God, they should simultaneously grow in love for one another. “The movement of the Holy Spirit, also known as the Pentecostal movement, has in its DNA – its life in the Holy Spirit – the vocation to build Christian unity,” he said. Capuchin Father Raniero Cantalamessa, preacher of the papal household, offered a reflection also focusing on the ecumenical vocation of the charismatic renewal. Tens of thousands of people gathered for hours of song and prayer before the pope arrived. As Rome’s summer sun beat down on the pilgrims, Elaine Pollard and Sandra Mobley from Holy Cross parish in Brooklyn, New York, found space in the shade under one of the few trees on the edge of the crowd. They had traveled to Rome with group of 88 people. As she spoke to Catholic News Service, the choir on stage started singing, “10,000 Reasons,” a song of praise. Pollard started to cry. “We were singing this song when my husband died” 15 months ago, she said. He was in the hospital, dying, and her adopted daughter started singing it. Other relatives, who couldn’t be there in person, were connected by Skype and they were singing it, too, as he passed away. Kaye and George Balsam and Terry Mroz from St. Gabriel the Archangel parish in McKinney, Texas, were at the Circus Maximus as part of a 130-person pilgrimage that visited the Holy Land before arriving in Rome for the Pentecost celebrations. The trip was George’s first with charismatics and he was enthused. “This is what we need to reinvent the church,” he said. Getting people excited about the faith is what is needed if “we want the church to get straightened out and stop losing people,” he said.